Unmatched in their softness and consistency, Schmincke soft pastels were created using the finest artist's pigments and a minimum of binders. The softness of the pastels permits a beautiful dense application, and the extremely high pigment concentration results in great color intensity. Sticks are rich and buttery in texture. The pigments slide right off the stick without any crumbling or breaking. 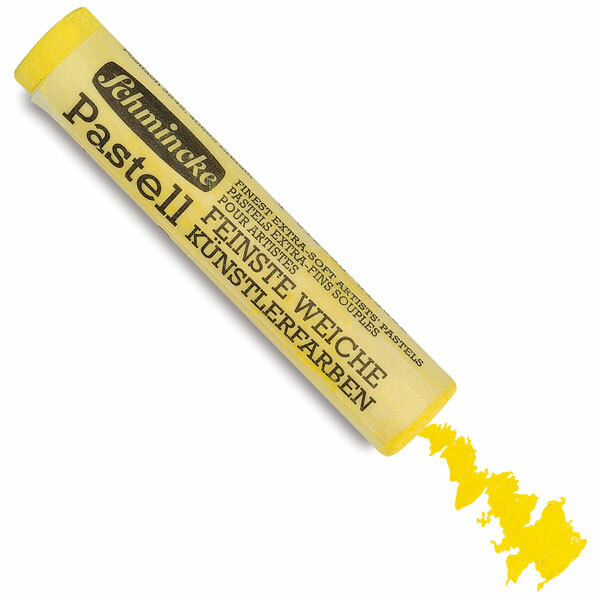 Schmincke Pastels are prepared by hand and by traditional machines, and also labeled by hand to help prevent breakage. Schmincke's generously sized full stick measures 2-5/8" long × 7/16" in diameter (67 mm × 11 mm). B — Black gradation with a color. D — Pure color, no added black or white. H — White gradation with a color. M — Gradation with more white. O — Gradation with still more white. Schmincke Artist Pastels also include a selection of 13 Dark Tones, available only in one concentrated gradation. White, Black, Serious Black, Silver, and Gold are also available only in a single gradation. Gift Idea — A variety of special combination Schmincke Pastel sets are available. See Schmincke Soft Pastel Sets for pictures and more detailed specifications of these sets. Complete Set of 400 — Schmincke has expanded the range of colors with more than a hundred new shades, and this beautiful hardwood box contains both the original colors and the new ones.